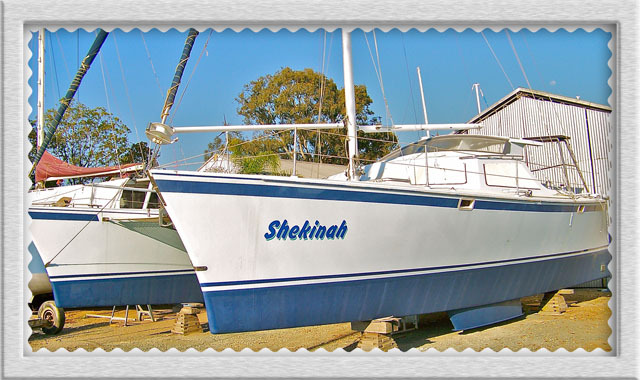 Having enjoyed our 40ft sailing catamaran Shekinah, as our home, for more than ten years we were somewhat reluctant to put her up for sale in the latter half of 2010. As a memento of this bygone chapter in our life’s travels, I have devoted a page or two and some pictures, from the sale of the yacht, to that memory. I guess this really is a page for fellow yachties and anyone interested in that kind of lifestyle and also exactly what makes a yacht tick, what’s inside and how one can enjoy living in such confined quarters but also in very remote locations….Enjoy! The first thing that stands out when you step aboard this vessel is the high quality of workmanship and the exceptional finish. 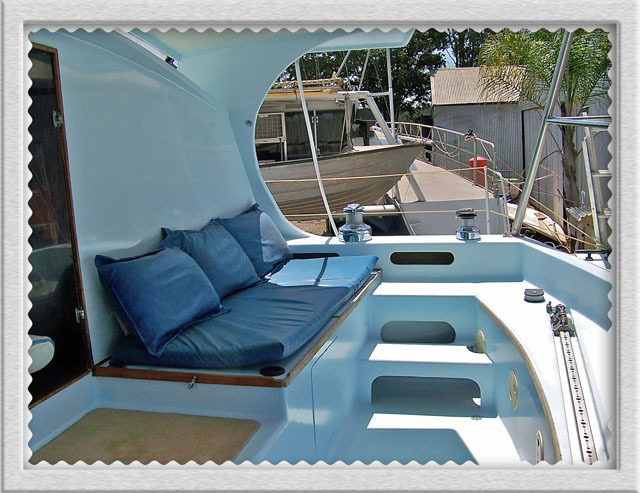 This Hitchhiker has been meticulously built according to the designer’s plans, and is thus a well performing and exceptionally safe cruising catamaran. The interior is beautifully finished with all the creature comforts combined to reflect an atmosphere of home but within a very practical sailing layout. 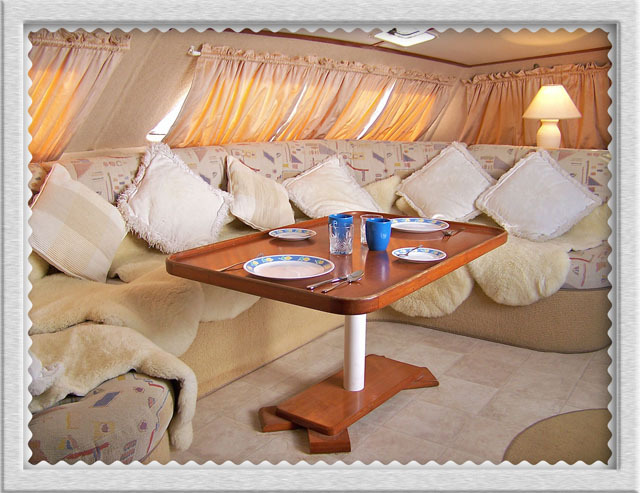 There is a huge amount of concealed storage for living aboard and many bouyancy chambers are built into the structure. Having completed several Pacific Island cruises to Vanuatu and New Caledonia, this vessel is fully equipped for remote area living aboard and comes with all safety equipment. 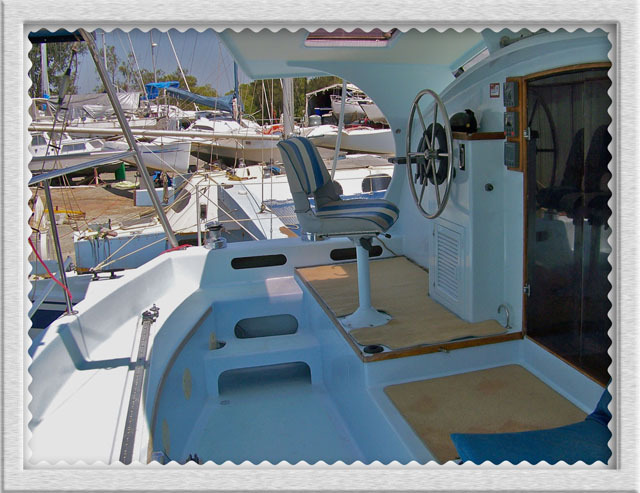 A great cruising vessel which is safe and ready to set sail. for crew comfort especially at night.. 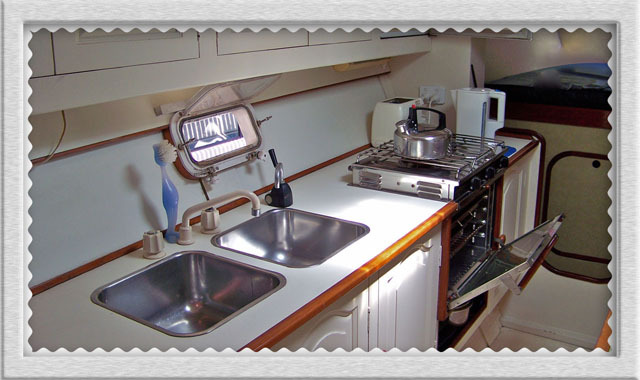 The picture below shows the whole galley which has Gas, 240V and 12 volt facilities. The galley includes 240v toaster, jug, microwave and frypan plus SS saucepans and frying pan and a large amount of kitchen utensils. The double guest cabin can be seen just forward of the galley. At the aft end (rear) of each hull there is a smaller cabin which , as pictured here on the starboard side, housed a single berth. 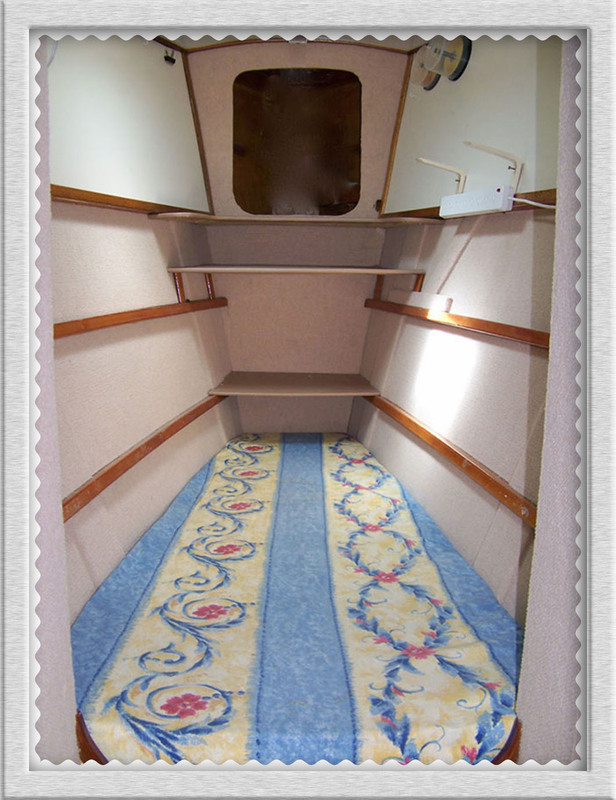 The similar cabin on the port side was our shower and toilet or ‘Head’. On any yacht space is always at a premium and that dictated extra use for this space. The cabin also doubles as a computer cabin, hanging clothes storage and a large storage area under the mattress. 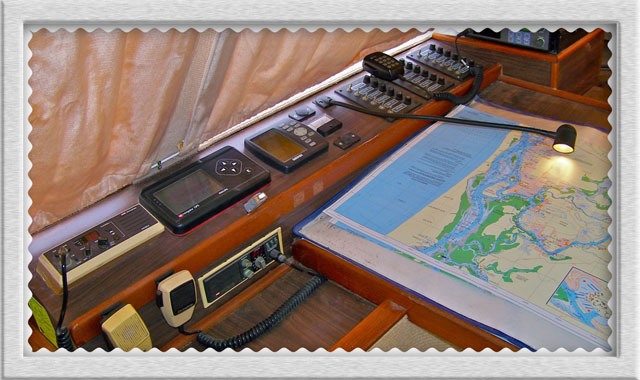 The heart of any sea going yacht has to be its navigation station and Shekinah has backups for just about everything. Two GPS units, three ship to shore radios, a high frequency modem for sending emails and a full size chart table littered with expensive charts. The Nav’ station is also linked to the steering and instrument station in the cockpit. 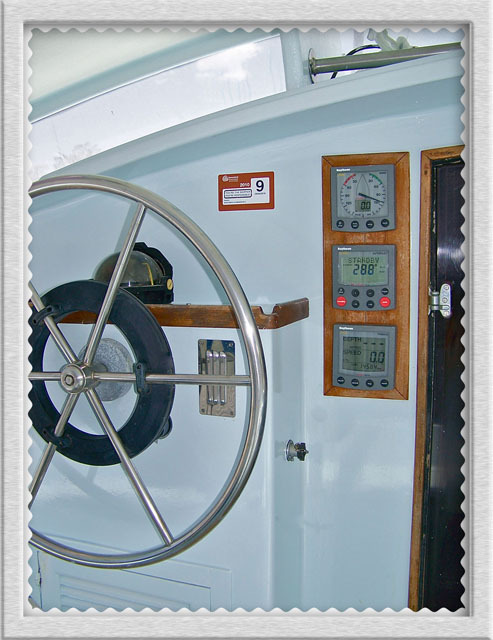 In the cockpit, the steering station has the main instrument panel for such things as boat speed, depth of water, wind speed, wind direction etc and of course, the autopilot which steers the boat in a pre determined direction. Back in the navigation station the main GPS unit also gives the autopilot corrections for tide and drift movements. clever stuff!